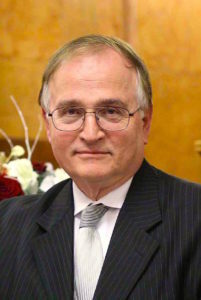 Nicholas A. Peppas is the Cockrell Family Regents Chaired Professor in the Departments of Chemical, Biomedical Engineering, Surgery in the Dell Medical School, and Pharmacy, and Director of the Institute of Biomaterials, Drug Delivery and Regenerative Medicine of the University of Texas at Austin. His work in biomaterials, drug delivery, regenerative medicine and bionanotechnology follows a multidisciplinary approach by blending modern molecular and cellular biology with engineering principles to design the next-generation of medical systems and devices for patient treatment. Over the past 40 years he has set the fundamentals and rational design of drug delivery systems and developed models of drug and protein diffusion in controlled release devices and biological tissues. In 2012 he received the Founders Award of the National Academy of Engineering (NAE), the highest recognition of the Academy, for these contributions to the field. Peppas is a member of the NAE, National Academy of Medicine, National Academy of Inventors, the National Academy of France, the Royal Academy of Spain, the Academy of Athens (Greece) and the Academy of Texas. He has been recognized with awards from AIChE (Founders Award, William Walker Award, Institute Lecture, Jay Bailey Award, Bioengineering Award, Materials Award), the Biomedical Engineering Society (Distinguished Scientist Award), the American Institute of Medical and Biological Engineering (Galletti Award), the Society for Biomaterials (Founders, Clemson and Hall Awards), the Controlled Release Society (Founders, Heller and Eurand Awards) and other societies. In 2008, AIChE named him on of the One Hundred Chemical Engineers of the Modern Era. He has been President of the International Union of Societies of Biomaterials Science and Engineering, Chair of the Engineering Section of the American Association for the Advancement of Science, and Past-Chair of the Council of BME Chairs. Previously, he served also as President of SFB and the Controlled Release Society. He is a fellow of AAAS, AIChE, APS, ACS, MRS, SFB, BMES, AIMBE, CRS, AAPS, and ASEE. He has supervised the research of more than 105 PhDs and about 180 postdocs and graduate students. Peppas holds a Dipl. Eng. from the NTU of Athens (1971), a Sc.D. from MIT (1973), and honorary doctorates from the Universities of Ghent, Parma, Athens, Ljubljana, Patras, the National technical University of Athens, and an honorary professorship from Sichuan University. Cell/polymer interactions; molecular recognition; thromboresistant biomaterials; protein/polymer interactions;bionanotechnology; drig and protein delivery; cardiovascular engineering, types 1 and 2 diabetes.